Discovered by Jean-Dominique Maraldi in 1746. Globular cluster Messier 15 (M15, NGC 7078) is among the more conspicuous of these great stellar swarms. At a distance of about 33,600 light years, its diameter of 18.0 arc min corresponds to a linear extension of about 175 light-years, and its total visual brightness of 6.2 magnitudes corresponds to an absolute magnitude of -9.17, or roughly 360,000 times that of our sun. Its brightest stars are about of apparent magnitude 12.6 or absolute magnitude -2.8 or a luminosity of 1,000 times that of our Sun, and its horizontal branch giants are about of magnitude 15.6. Its overall spectral type has been determined as F3 or F4. The globular cluster is approaching us at 107 km/sec. In amateur instruments, M15 appears somewhat smaller, perhaps about 7 arc minutes visually and 12.3 arc minutes photographically. On the other hand, the tidal radius of this globular cluster, beyond which member stars would escape because of the Milky Way galaxy's tidal forces is a bit larger: 21.5 arc minutes, corresponding to a distance of 210 light years from the cluster's center. This globular cluster has the third rank in known variable star population, after M3 and Omega Centauri; a total of 112 variables have been identified. One of them is apparently a Cepheid of Type II (a W Virginis star). M15 is perhaps the densest of all (globular) star clusters in our Milky Way galaxy. The Hubble Space Telescope has photographically resolved its superdense core, as shown in this HST image. M15's core has undergone a process of contraction called "core collapse", which is common in the dynamical evolution of globulars; of the 150 known globular cluster within our Milky Way Galaxy according to W.E. Harris' database, 21 have been found to contain a collapsed core (among them, besides M15, the Messier globulars M30 and M70), and there are 8 more candidates, among them M62. This central core is extremely small compared to the cluster, only about 0.14 arc minutes (8,4 arc seconds) in angular diameter, corresponding to a linear extent of roughly 1.4 light years. The half-mass radius is 1.06 arc min, or linearly about 10 light years - half the mass of this cluster is concentrated in the innermost sphere of that radius. It is still unclear if the central core of M15 is packed so dense simply because of the mutual gravitational interaction of the stars it is made of, or if it houses a dense, supermassive object, which would be resembling the supermassive objects in galactic nuclei. The one in M15 would among the nearest and better observable to us, being only little more remote than the Galactic Center and much less obscured by interstellar matter. Although the true nature of these objects remains obscure for the moment, many scientists believe they are strong candidates for "Black Holes". M15 was discovered by Jean-Dominique Maraldi (Maraldi II, 1709-88) on September 7, 1746 while he was looking for De Chéseaux' comet; he described it as 'A nebulous star, fairly bright and composed of many stars'. Charles Messier, who cataloged it on June 3, 1764, and Johann Elert Bode couldn't make this out and described it as 'nebula without stars,' so that it remained to William Herschel in 1783 to resolve this fine star cluster. 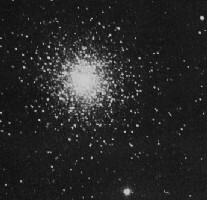 M15 was the first globular cluster in which a planetary nebula, Pease 1 or K 648 ("K" for "Kuster"), could be identified (Pease 1928, on photographic plates taken at Mt. Wilson in 1927). Leos Ondra has provided more information on this planetary nebula. In 1976 Peterson has reported a possible second planetary nebula in this globular, situated near its center, which was however never confirmed since (thanks to Leos Ondra for pointing out this fact), so that Pease 1 remains one of only four known planetary nebulae in Milky Way globular clusters. Moreover, globular cluster M15 contains the considerable number of 9 known pulsars, neutron stars which are the remnants of ancient supernova explosions from the time when the cluster was young. These have the designations PSR 2127+11, as well as PSR 2127+11 A to 2127+11 H. The most interesting of these objects is PSR 2127+11 C, which is apparently a component of a neutron star binary, i.e. it has a companion which is also a neutron star (S.B. Anderson et.al., Nature 346:42 (1990), T.A. Prince et.al., ApJL 374:L41 (1991)). This system, like similar ones such as the famous Hulse-Taylor binary pulsar PSR 1913+16, or the lone-standing galactic binary pulsar PSR 1534+12, is of particular interest because they exhibit strong general-relatistic gravitational effects (and is thus a natural laboratory to test Einstein's General Relativity Theory) such as significant perihelion shifts, effects on light, and emission of gravitaional radiation. The latter effect, the emission of gravitational radiation, carries away rotational energy and causes a slowdown of the pulsar frequency as well as of the orbital period. M15 can be found extremely easily: Find the 2nd mag star Epsilon Pegasi, and Theta Pegasi SE of it. Follow the line from Theta over Epsilon and find M15 3 1/2 deg W and 2 1/4 deg N of Epsilon. A 6th mag star is about 20' away to the East, another one of mag 7.5 about 5' to the NNE. With its apparent visual brightness of magnitude 6.2, M15 is about at the limit of visibility for the naked eye under very good conditions. The slightest optical aid, opera glass or small binoculars, reveals it as a round nebulous object. It appears as a round mottled nebula in 4-inch telescopes, with at best the very brightest stars visible, but otherwise unresolved in a fine star field. In larger telescopes more and more stars become visible the outer parts are resolved, with a more irregular, non-circular outline. The compact core, however, stays unresolved even in large amateur telescopes, but the brightest stars can be glimpsed even there. Chains and streams of stars seem to radiate out of this core in all directions, but less concentrated toward the West.